Late yesterday afternoon, our area of Hampton Roads got pounded by a quickly moving storm that overtook us in a flash. One minute it seemed like a perfectly lovely day, a moment later, angry black clouds moved in, and in just minutes torrents of rain sliced the silence, and the winds whipped up to 73 miles per hour, ripping trees apart and hurling huge branches several houses away. Our house made it through with some damage to our front gutter but was otherwise unscathed. 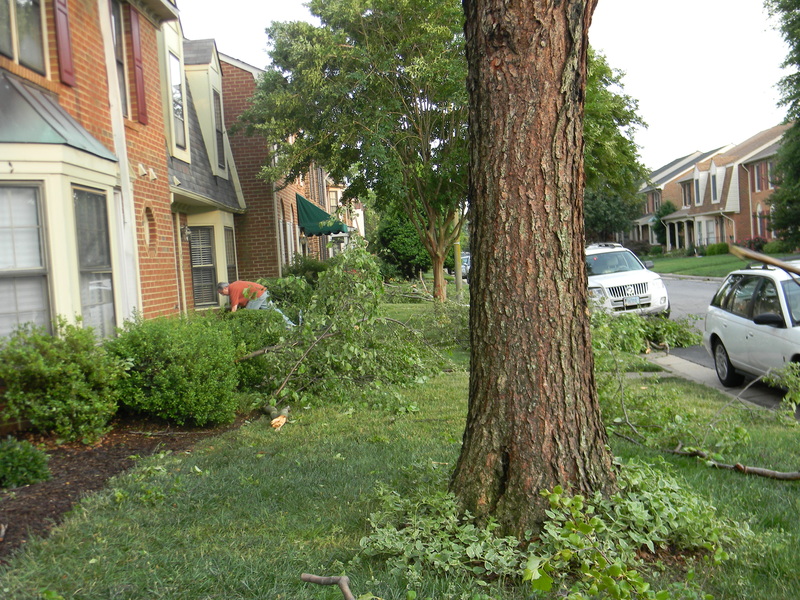 The neighbors on either side of us were not so lucky. A huge part of what had been a lovely and graceful river birch a few houses down had damaged the roof and completely torn down the gutter of the house on one side of us. On the other, a shutter was torn off, maybe by the branch whizzing by like a missile, or perhaps it was just the wind. When it was finally safe to venture out, neighbors emerged to survey the damage. Much to my chagrin, the first words I heard from one neighbor were acrimonious words directed at the owners of the birch. They were angry because they felt the tree was a menace and should have been taken down. The owners of the birch had gone to great expense to have this tree pruned about a year or so ago and I thought the tree enriched the appearance of our side of the street. It matters not what I think. But it does matter what was said. This entry was posted in Just Blogging and tagged community, Hampton Roads, home, life, neighbors, relationships. Bookmark the permalink. You needed my Inner Curmudgeon there to handle your cranky neighbors!! I would love to have watched you deal with them! They’d be shaking in their boots! What a nice thing to say! Thanks for taking the time to comment. And I’ve seen your pictures; I’d LOVE to visit your neighborhood! Oh, you would fit in around our place so well! It is honestly a first instinct around here pitch in and help those in need. Our local paper just received a letter to the editor, saying it was the “kindest town in South Dakota”. Thank you for showing people humanity in its finest. I hope we’re in the majority! In England – particularly south east, that’s a common attitude. It’s horrible. Really! I had no idea. I grew up in Connecticut and just moved here a couple of years ago after nearly 30 years in San Antonio, and neighbors always helped neighbors. We were very surprised and disgusted by their attitude. You and your husband sound very polite… I would have ripped into the scrooges who were complaining about the tree! I think we were stunned! Plus, we have to live with these people! Most fortunate that no one was hurt, of course, but nice that you demonstrated kindness. Sometimes when people are rude I try to be open to the idea that something inside of them is hurting or wrong. That doesn’t excuse their rudeness, but it does reduce the angry feelings I might feel. If it had been just one person, I might have felt that way, but not one other neighbor pitched in. They stood around and made ugly faces and rude comments. Wow! I’m so sorry you had that experience; and I’m glad that everyone is physically okay! I’m pretty surprised that someone would expect to NOT pick up debris in their own yard (no matter where it came from), although people can be a little weird about these things, I know…. Still, I am pretty stunned that neighbors expected the tree owner to pick up branches from their yards without even pitching in — that young guy went way above the call of duty in my opinion! You’re lucky to have HIM as your neighbor! Yes, he and his wife and three sweet little ones are a treasure. Ha! Didn’t even connect. Had to go back and look again and then realized the picture was from Sesame Street. Yes, great minds do indeed think alike! That is sad. Good thing there are still good people and good neighbors out there like you! I’d like to think my husband and I are in the majority. I’d never come across sentiments like this before.